Deer can hide between straight-line drivers because humans cannot move silently through woods. Traditional drives are made by two lines of hunters: one line made up of stationary hunters, the standers, and a second line made up of hunters moving in unison toward the stationary hunters, the drivers. As a rule, the stationary hunters are positioned downwind so they will not be smelled and easily avoided by deer driven towards them by the drivers. A drive is generally a very productive way to harvest whitetails, yielding prodigious amounts of venison under almost any weather condition or circumstance. The trouble is, many experienced adult deer readily recognize drives before they even begin and use a number of tactics to successfully avoid being driven toward the standers. Most deer taken by hunters making drives are young and inexperienced deer, fawns and yearlings. The inability to take adult bucks via drives was the principle reason I finally convinced my father we should leave our family hunting gang and begin hunting whitetails on our own, mostly stand hunting — still-hunting occasionally. Later studies of tracks in snow made by deer caught between two lines of hunters preparing to make a drive or making a drive revealed older experienced deer generally use one or two of four means to escape hunters. 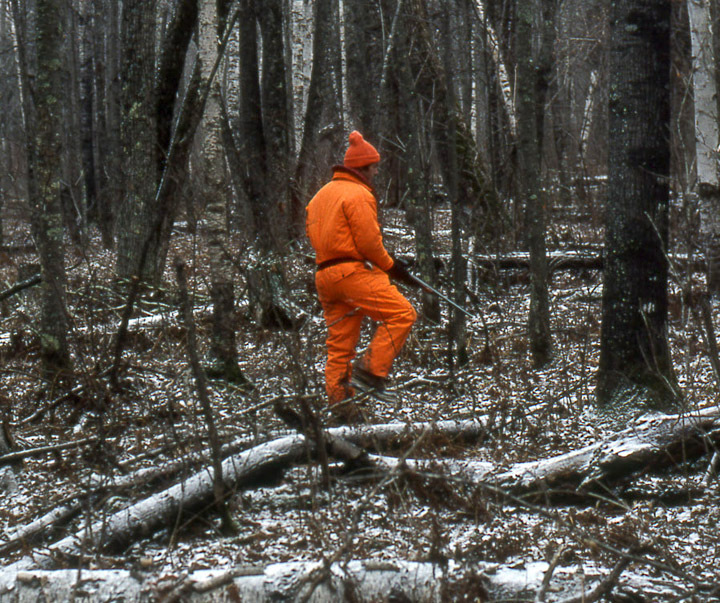 Whether hunters are easily heard getting into position or not, many experienced deer will begin make their escapes well before the drive begins, moving quickly crosswind until sounds and odors drifting downwind from the line of upwind drivers can no longer be detected — effectively outflanking the drivers without the drivers knowing it. Upon realizing a drive is being set up, dominant breeding bucks hesitate little to abandon does in heat. Experienced deer that fail to recognize a drive before it begins will quickly realize what is happening after the drive begins, sounds and odors drifting downwind from the skirmish line of approaching drivers easily identified 200 yards or more away, thus enabling these deer to also abandon the area without being seen. If flanking movement is not practical, areas on either side of the area being driven, being wide openings or impassable (a lake or high fence, for example), experienced adult deer will still find it relatively easy to avoid being driven toward the standers. Because drivers noisily hike straight lines (by the compass) downwind, it is a simple matter for such a whitetail to freeze in cover, standing or lying down, where it will be unlikely to be spotted by unwitting drivers passing on either side. On several occasions I've watched older bucks avoid discovery by drivers lying down beneath boughs of fallen evergreens. Whenever drives are made, there are areas through which drivers are reluctant to travel: wet bogs or swamps, steep wooded slopes or dense patches of brush, briars or young trees, for example. Older bucks don't hesitate to boldly hide in such places to avoid passing drivers. For all of the above reasons, a cross-wind drive with drivers following well-orchestrated zigzag paths is much more effective for taking adult deer, including older bucks. In a crosswind drive, not only are the standers still fairly protected from being scented by driven deer, but so are the drivers, meaning the drivers will enjoy greater numbers of opportunities to take deer. Zigzagging drivers moving crosswind not only make it difficult for experienced adult deer to decide where to freeze in cover between approaching drivers but make it difficult for these deer to attempt to outflank the drivers (they can't smell them). Turns made by drivers can be orchestrated in one of two ways: all drivers turning every few minutes by the watch or all turning upon hearing a pre-decided signal given by someone in the middle of the line — the honk of a goose or three caws of a crow (using a call), for example. Rather than flee straight ahead of the zigzagging drivers, experienced adult deer will soon turn into the wind and flee in that direction. For this reason, a few standers known for great accuracy on bounding deer should be posted along the upwind side of the drive. Though some older bucks will have escaped before the drive began, big buck harvests on the upwind side of drives are sure to occur fairly often.